'How am I supposed to live without you' was originally recorded in 1983 by Laura Branigan. 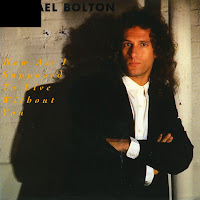 The song was written by Michael Bolton. He wrote several songs for various artists, during a gap of seven years in which he didn't release records of his own. His first two albums, 'Michael Bolton' (1975) and 'Everyday of my life' (1976) had failed to chart, but after he wrote some hit singles for others, his own career started once more from 1983 onwards. In 1989, he released the album 'Soul provider', on which he recorded 'How am I supposed to live without you' himself. It turned out to be a good choice: it was his first international hit, peaking at number 3 in the Dutch Top 40 and the UK singles chart. From then on, he remained popular in various countries for inexplicable reasons: these days I find his voice particularly grating.